Exploring Courage in all my classes this week. I’m reading a lot about fearlessness right now – seems everyone is doing the best we can to keep us all bolstered and buoyed and just generally breathing through it all. I am doing my part by teaching tonight on Courage. I’m reminded of several years back, when I led all my classes on a journey through Brene Brown’s The Gifts of Imperfection, and her reminder that the root of the word courage is heart (more obvious in the French coeur or Spanish corazón). Specifically, speaking your truth with your whole heart. Since there are infinite ways to speak our truths – to communicate what is true for us – beyond just words, I am reflecting on how my life itself can be an expression of my truth. How I can communicate my values, commitments, and desires through everything I do, not just my words. Courage is speaking your truth with your whole heart. How can my actions communicate what I value? How can I reinforce what I value through the intentional investment of my time and energy? How can I make my very life an expression of what I hold dear? One upcoming way I plan to do this is by joining the commemoration of International Women’s Day by joining A Day Without A Woman protest next Wednesday – which means I will not be holding Wednesday night yoga. I invite you to check out local ways to participate if you feel so moved. In general, if you’re grappling with the same questions I am regarding how to embody courage and commitment in these times, join me at yoga this week. We’ll sort it out – as always – together. 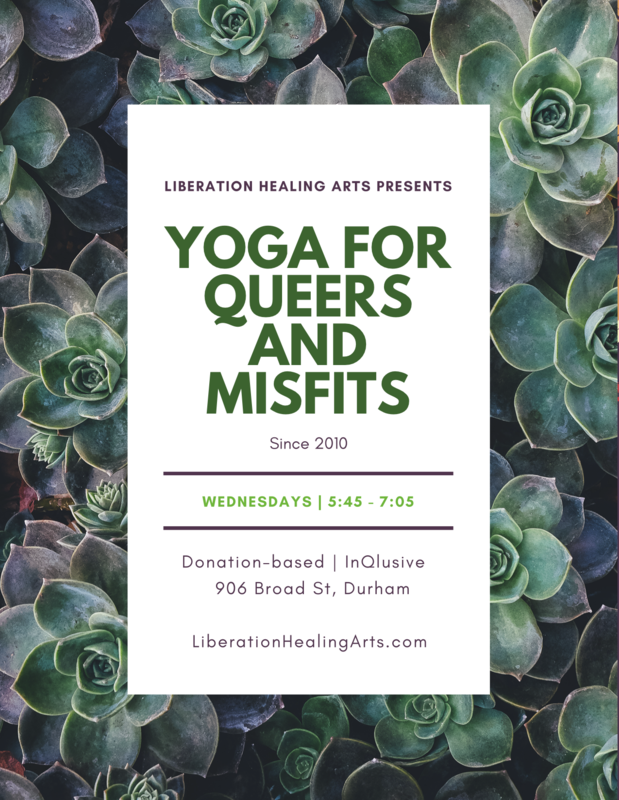 This entry was posted in Uncategorized and tagged all-levels yoga, community based yoga, courage, donation-based yoga, durham yoga, inclusive yoga, intersectional, lgbtq, lgbtq yoga, patty adams, patty adams yoga, queer yoga, queer yoga in durham, resilience, resistance, self-care, social justice, social justice yoga, trauma-informed yoga, yoga, yoga for queers, yoga for queers and misfits, yoga in durham. Bookmark the permalink.